Presidential Airways (IATA: XV, ICAO: n/a , Call sign: Washington Eagle) was an airline with its headquarters on the grounds of Washington Dulles International Airport in Northern Virginia. It was founded in 1985 by Harold J. (Hap) Pareti, formerly an officer at People Express Airlines, (known as "PEOPLExpress") as a low-cost carrier, with Boeing 737-200 service from Dulles to Logan International Airport in Boston, Massachusetts commencing October 10 of that year. A small fleet of B737-200 jetliners were initially operated by the airline. 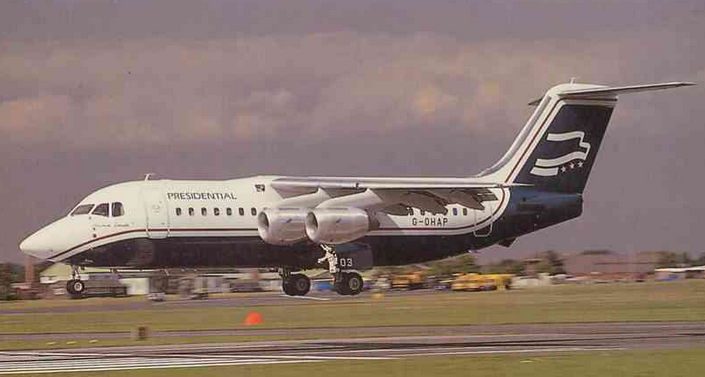 Presidential then expanded to a number of destinations, merging with the original Colgan Air in 1986 and adding the British Aerospace BAe 146-200 jetliner and orders for the de Havilland Canada DHC-8-300 Dash 8 turboprop to its fleet (only two of the DHC-8-300s were ever received). It was unable to sustain its expansion, however, and became a regional feeder for Continental Airlines in 1987 and then United Airlines in 1988. In early 1989, Presidential attempted to capitalize on the "hub fever" then prevalent in the southeastern United States by trying to raise money from investors in Birmingham, Alabama with the stated intent of operating a new mini-hub at the Birmingham-Shuttlesworth International Airport (BHM). Presidential's already shaky financial condition and eventual bankruptcy assured that nothing ever came of it. Burdened with debt from its changes of business plan, Presidential filed for Chapter 11 bankruptcy on October 26, 1989. It ended operations on December 5, 1989 and its assets subsequently liquidated. Shortly before that time, employees received a pay cut for two pay periods in an attempt to improve cash flow at the airline. 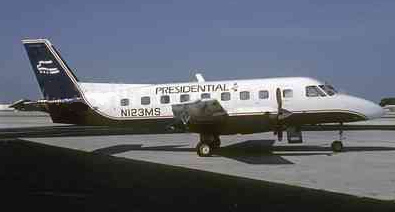 At one point just before its demise, Presidential operated an odd mix of fleet types: twelve British Aerospace BAe Jetstream 31 and Jetstream 32 commuter turboprops (some of which were contracted), two early model Beechcraft 1900 commuter turboprops, eight BAe 146 jets and one aging Boeing 737. The BAe Jetstream turboprops were operated as United Express flights as were the Dash 8 propjets. The 737 primarily flew roundtrip service between Washington Dulles (IAD) and MacArthur-Islip (ISP) on Long Island, New York. In 1988, the 737 was used as the campaign plane for first Republican Senator Robert Dole and then Massachusetts Governor and Democratic nominee for president, Michael Dukakis. Reporters assigned to Dukakis nicknamed the plane "The Sky Pig" because it was so slow.